Our Kickstarter campaign to bring back our Gospel enamel mug is soon coming to an end and we’re so close to our stretch goal of $10k to offer a second mug design! We’re super stoked on how the design came out. So much so that we decided to make a special leather banner of the design as well! 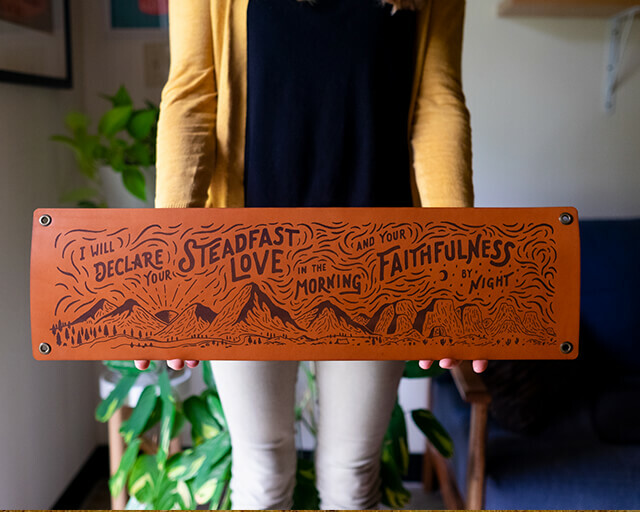 The design is of Psalm 92:2 and is a reminder of God’s daily love and faithfulness to us. Whether we’re in a season of plenty or want, His love remains steadfast and He is ever faithful. The leather banner is currently available only as an add-on through our Kickstarter campaign. So when you pledge on our Kickstarter at any level you can add an additional $50 to your pledge and you will receive this 24”x7” banner along with your mug(s)! Join our community and receive free Scripture resources, get early access to sales, and be automatically entered in our monthly giveaways! Thanks for joining the Scripture Type community! Copyright © 2019 Scripture Type. All Rights Reserved.